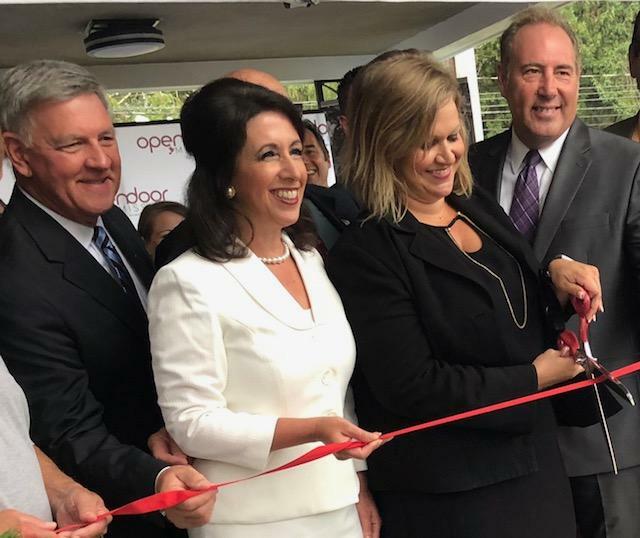 Left to Right: Sen. Rich Funke, Monroe County Executive Cheryl Dinolfo, Open Door Mission Executive Director Anna Valeria-Iseman, Sen. Joe Robach cut ribbon for Coldwater House in Gates. Open Door Mission has opened its first transitional housing for homeless women and children. Coldwater House is located on Coldwater Road in Gates. It has enough space for seven families with up to three to four children each. Felisha Howell is one of the first residents. The 43 year old mother of four has been living in her car for almost two years, unable to afford rent payments with her home health care aide salary. "Rents are extremely high and it doesn't add up to what people are making, so you're struggling to just make rent and you have other bills to pay,” she said. “Once you miss a week of work, that's it. Everything else snowballs." Howell's children, ages 26 to 14, are living with relatives. She hopes to reunite with them once she completes her program at Coldwater House. Women and children are the fastest growing segment of the U.S. homeless population, said to Anna Valeria-Iseman, Executive Director at Open Door Mission. "The solution to homelessness is not always simply a home,” she said. “We must get to the root causes that led to the homelessness in the first place, and that is how we prevent the circumstances from presenting themselves again." Coldwater House has enough suites for up to seven families with up to three to four children each. Open Door Mission hopes to have two to three families enrolled in its program by Labor Day. Howell says she’s excited about starting the next chapter of her life. "What I expect is, it's not even necessarily what I will get,” she said, “but what I will give to the other families that will come here to show them that faith is important in this part of life." Open Door Mission is partnering with Resolve of Greater Rochester to provide counseling for women who are victims of domestic violence. Resolve CEO Alli O’Malley said domestic violence is the number one reason women and children end up homeless. Residents of Coldwater House will receive additional support services so they can ultimately transition to independent housing.